Sometimes a brightly colored wall and a serendipitous guest of wind can combine to create dynamic and unique portrait! For this photo, the bride was waiting for the elevator to go down to the ceremony site when the wind began gusting through the hallway. I love the way the veil is blurred in the foreground of the image, creating a sense of movement; use of the Canon 16-35 wide angle lens emphasizes this sensation. In her gorgeous Vera Wang dress and floral headpiece, the bride's pose & expression is relaxed. She maintained that calm happiness throughout the day and was such a joy to work with! She and her fiance wanted to get married in a tropical location so they and all their friends and family could "leave their day-to-day lives behind and enjoy a worry & stress-free holiday!" And that's exactly what they all did! Despite the little bumps on the day - the wind, a missing bridesmaid shoe, an unexpected delay at dinner, they went with the flow and enjoyed every moment. 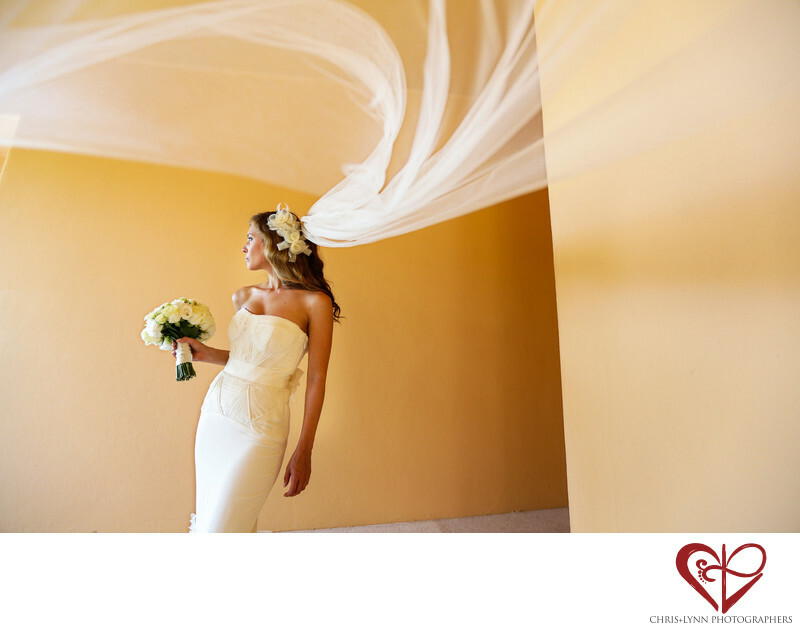 This Esperanza wedding was featured in multiple publications including the Canadian luxury wedding publication Perfect Wedding Magazine and the wedding blog Aislewalk. Location: Esperanza An Auberge Resort, Carretera Transpeninsular Km. 7 Mz 10, Punta Ballena, 23410 Cabo San Lucas, B.C.S., Mexico . 1/250; f/2.8; ISO 800; 17.0 mm.